The outstanding advisors are, top row from left, Eric Haas, Mireya Martinez, Elizabeth McQuiston of the Disability Resource Center, Lesley Butler, Gerd Welke, Cord Brundage; bottom row from left: Lily Gossage of Maximizing Engineering Potential, Monica Kays, Mehrdad Haghi, Gregory Barding, Weimin Li and Amàlia Llombart. 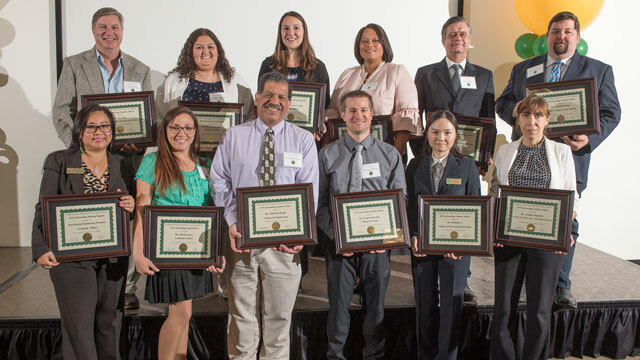 Cal Poly Pomona honored this year’s Outstanding Advisors for their dedication to student success at an annual awards reception on April 26 in the Bronco Student Center. The awards highlighted exceptional faculty and staff advisors, as well as two outstanding programs.